Amazon Unveils Cloud-Based Music Service : The Record Amazon's service allows users to store music online and access it via any Internet-connected device. On All Things Considered today, Laura Sydell reported on the fight over the legality of cloud-based music services. According to a copyright lawyer, record labels "don't necessarily consider it a fair use for a user to make ... copies for personal use." Music publishers like ASCAP and BMI aren't pleased with Amazon's new service either. The head of marketing for ASCAP worried that the Cloud Drive "is simply a way to avoid having to pay songwriters and composers ... as well as artists." To hear that report, click on the audio link at the top of this post. There has been a lot of speculation about the efforts of Google and Apple to come up with a way for consumers to easily access all of their music on all of their devices through a so-called "cloud music service." But Amazon.com beat them to the punch early today, rolling out its own music and video storage locker in the cloud. Until now, when most consumers downloaded music, they could play it only on the device they used for downloading — unless they went through the hassle of transferring it from, say, their PC at work to their Mac at home. But Amazon Vice President Bill Carr says that with his company's new cloud service that's no longer necessary. "You can buy once — buy your music once and play it anywhere — and it lets you get your whole music library in one place," Carr asserts. The company says that when consumers purchase digital music from Amazon, that music will automatically be stored in their Amazon-hosted locker — or Cloud Drive — for free. Music purchased elsewhere, say from iTunes, can be transferred to Amazon's cloud and stored without charge — up to a point. 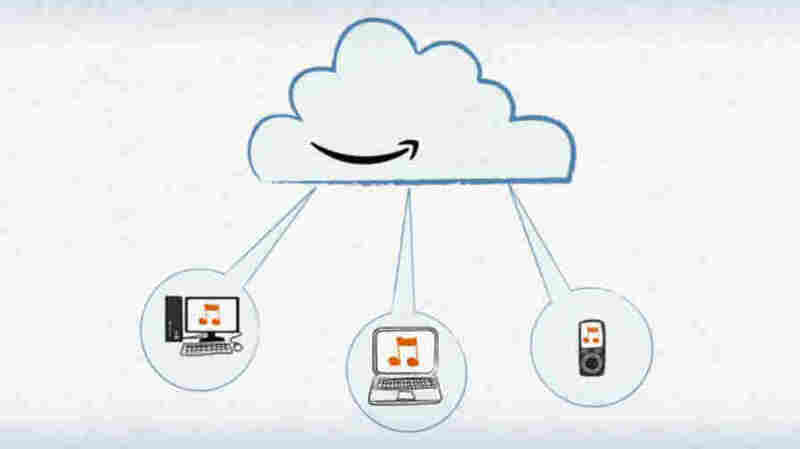 Using an application Amazon is calling a Cloud Player, users will be able to access that music on any computer connected to the Internet, as well as Android phones, also for free. Consumers wanting to keep a large quantity of music, video and other stuff in Amazon's cloud will have to pay a fee. To get started, Carr says, every Amazon customer will get 5 GB of free storage space (that's enough for nearly 1000 songs encoded at Amazon's current bitrate, though you can encode songs from your own library at any bitrate you please and upload them to your Cloud Drive). Beyond that, Amazon will sell additional storage plans starting at $20 per year. Of course, there are exceptions — any purchases made from Amazon will be stored free, and a promotion grants 20 free GB for a year to any user who purchases a full digital album from Amazon. Amazon is no stranger to cloud storage: the company backs up the books that users of its Kindle e-readers purchase from Amazon, and consumers say they like being able to start reading a book on their computer and continue reading it on a tablet or a smart phone later. Amazon sees another advantage to cloud-based storage. Carr says that when customers have easy access to their music, they tend to buy more. While that might seem to be a plus for the beleaguered music industry, the record labels have actively fought an earlier entry into the cloud storage game. In November 2007, 14 EMI-affiliated labels and music publishers filed a copyright infringement suit against MP3tunes.com, which continues to operate – doing basically what Amazon is proposing – pending a resolution of the case. The labels argue infringement because of a feature of MP3tunes that allows users to store "unauthorized" downloads in their lockers. MP3Tunes has countered that it's just storing music for its users. Amazon seems to have taken up the same position. In an email, a company spokesperson wrote, "We do not need a license to store music in Amazon Cloud Drive. The functionality of saving MP3s to Cloud Drive is the same as if a customer were to save their music to an external hard drive or even iTunes." Amazon may be in for a fight, but the push to the digital music cloud is just beginning: Google is reportedly field-testing its own cloud-based music service and the competition in this market is likely to be intense.